This sweater is hand crocheted thick and warm and perfect for those cold days! The hood attached is a plus so there is no need to wear a hat when you want to keep your ears warm. This sweater is designed to be more of a Tunic Sweater so it will not ride up on your back and expose your skin while moving around. This sweater makes me think of being at that Rustic cabin in the woods or wearing it after skiing on the slopes all day. Wear it taking a walk or come back and slip into this Sweater to relax in front of a warm fire. Why not give him something that will keep him warm and comfy along with being a wonderful addition to his wardrobe! I hand crocheted this type of sweater for my son as a Christmas gift. It was a thrill to see this pattern take shape and give it to him so it could keep him comfy and warm! This sweater is Made to Order and is Not in Stock. 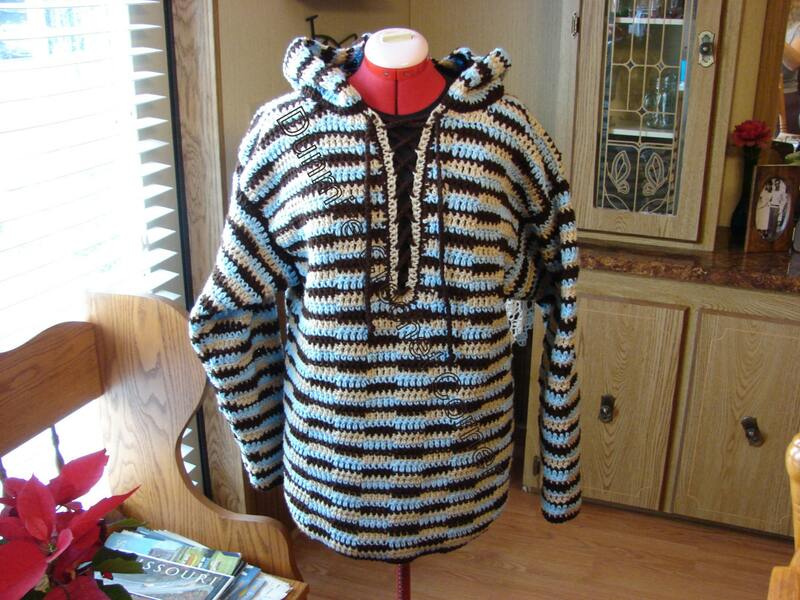 The sweater pictured is a size XL which is 46 - 48", 116.5 - 122 cm. In the variations above you will get a list of different sizes to choose from. You can also choose between different colors from the variations. If you are interested in a multiple colors please message me on what color combination you would like. Any Alteration to the Pattern Design or any Stitch difference will result in a price increase of the sweater accordingly. Colors will vary due to the difference in monitors. This can be made in different colors and would take approx 3-4 weeks to complete. If interested in having one custom made please contact me in a message. If interested in having any item shipped outside of the US please contact me.